If you look up in the night sky, can you see the Milky Way? If so, then you’re luckier than one-third of the people living on the planet. The situation is even more dire for people living in the west. According to an international team lead by Fabio Falchi from the Light Pollution Science and Technology Institute in Italy, 60 percent of Europeans and 80 percent of people living in North America cannot see our galaxy at all. Out of the 20 most industrialized nations, Italy and South Korea are those with the widest territory polluted by artificial lighting, while Canada and Australia are the least polluted. If we take the very stringent constraint of light pollution to be the level of brightness at which artificial light substantially obscures any astronomical observations, then more than 80 percent of the world and almost 100 percent of the western sky is to be considered polluted. 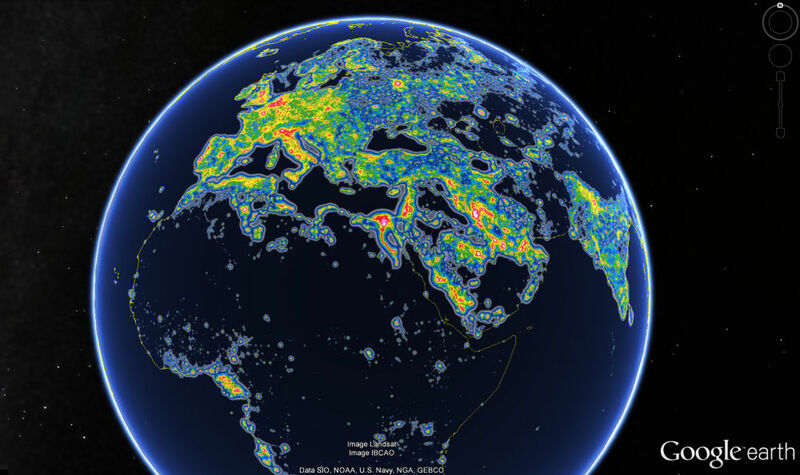 The project was presented in Science Advances as the New World Atlas of Artificial Night Sky Brightness, and it has been carried out as voluntary work without any specific funding. This work is a significant upgrade on the original atlas produced by Falchi and colleagues over a decade ago. The new atlas uses new tools and includes data from the high precision satellite Suomi NPP. The analysis is based on several assumptions. The transparency of the atmosphere, how much light from cities goes upwards, the time of night, and the light spectrum are all variables that were set by the researchers, so the atlas might not always reproduce the real world correctly. Even considering the potential uncertainties, the situation remains quite severe. Artificial light strongly influences our sleeping patterns and there are parts of the world, like Singapore, that never experience true night. Light pollution could not only stop us from seeing the sky, but it could be negatively affecting our health. In particular, the reduction of blue light has been seen as a particularly important issue. Blue light boosts attention, reaction times, and mood, which is great during the day but not so much at night. To save energy, there has been a significant move towards LEDs, and while they are much better for the environment they emit a significant amount of blue light. If all street light were LEDs, the sky would become twice as bright. While the study might not come across as very optimistic, the researchers suggest several ways to reduce and mitigate the effects, such as light shielding, turning off and limiting public lighting when not necessary, and a significant reduction of blue light emission from LEDs. 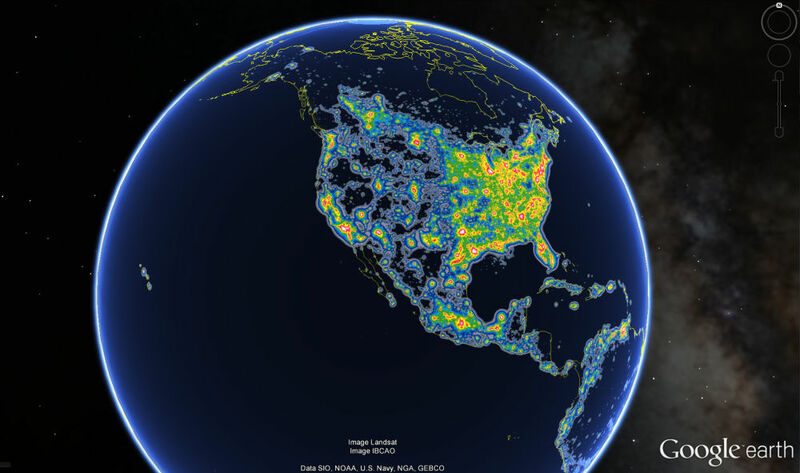 Speaking to IFLScience, lead author Falchi discussed what can be done to reduce light pollution. "In Italy cieloBuio Association was able to contact directly regional politicians and convince them of the opportunity to enforce laws against light pollution. In this way, at least, we got a stop in the increase of light pollution. We need, as for almost all other pollutants, to lower them with time, so we need to increase action. And the first step is to increase the awareness of the problem." Although a recent study showed no relation between lighting and road safety, some people still don't think living cities completely in the dark is safe. 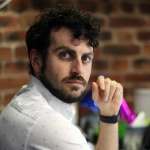 "Most people think that lighting our environment as much as possible will lower crime and traffic accidents. But first of all these claims must be proven, before using them to spend billions of Euros annually to power public and private lighting," added Falchi. "For now the proof is missing."